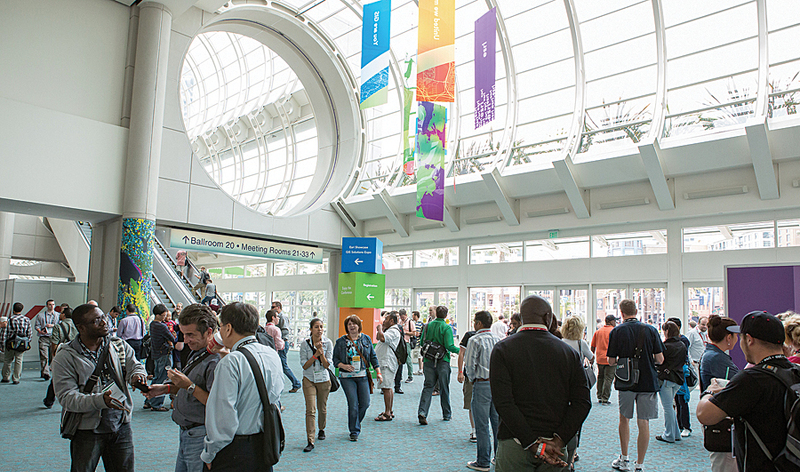 GIS professionals from around the world come to the Esri International User Conference. At the heart of Esri's 2013 innovation is web GIS that puts GIS into the hands of many people. On the first day, Esri and a number of users presented strides made in GIS services, content, analytics, and enterprise platforms. These innovations were prominently demonstrated on different devices connected to web GIS platforms. "Web GIS enables you to easily build maps that work everywhere," said Dangermond. "It opens the door for creating a participatory environment in which GIS tools are made more accessible and flexible." Dangermond announced that the ArcGIS license will now include a subscription to ArcGIS Online, which literally makes a world of content accessible from within the ArcGIS environment. Esri's content is organic in nature—the collection is continually growing with data contributions from thousands of organizations. Presenters highlighted newly added content, including new basemaps and authoritative datasets. Using web GIS technology, they showed ways to access vast collections of ready-to-use maps and applications available on ArcGIS Online. Content products now include extensive 30 cm imagery for the entire United States in both remote and populated areas. Moreover, Esri added 30 cm imagery for many European countries and thousands of cities around the world. Also added were imagery basemaps, soils, geology, and living elements of the world, such as species, vegetation, and habitat. More demographic products are available, such as the US per capita income dataset. In 2013, Esri launched Premium Image Service, which streams highly accurate and current imagery data. This ArcGIS Online service includes premium imagery data from RapidEye, DigitalGlobe, and AccuWeather on one platform. The imagery data is streamed directly into ArcGIS. Users access the multispectral service to use tools to change band combinations on the fly and select predefined imagery content, such as vegetation. The Esri team announced new analytic capabilities in ArcGIS, such as the land modeler web application. One Esri presenter used a cell phone to select multiple data layers and variables and to assign weighted values to these variables. He then ran the analysis on his phone. People can use Microsoft Office to access landscape data in ArcGIS Online from the spreadsheet to enrich their analysis and create maps. Another tool that makes analytics easier is Operations Dashboard for ArcGIS, which monitors, tracks, and reports sensor data. To demonstrate this tool in real time, a presenter tracked an airplane's location and measured jet noise levels detected by audio sensors. Using a smartphone, he drew a virtual fence around an area on the map and set the application to respond when a sensor within the virtual fence had been triggered by sending alerts to other mobile devices. Solution templates provide location analytic themes and applications. Due to integration with Microsoft Windows and IBM Cognos, location analytic processes are easier. Using these common business tools, a presenter showed how people can visualize data and also use it for analysis. Whether connected to or disconnected from the organization's platform, anyone can use GIS for analysis. Another presenter demonstrated the elegance of Esri's analytical tools by creating a statistical hot spot on the map. Geoprocessing tools automated the geostatistical hot spot processes, allowing her to calculate cluster distances and create visualizations. Developers explained the extensive performance capabilities of Esri's latest release, ArcGIS 10.2, for managing large datasets and running visualization and analysis tools. ArcGIS takes advantage of a computer's CPU for parallel processing, which boosts response. Performance enhancements have improved geoprocessing and analytical tools, such as those used to perform a feature-weighted analysis. Developers can now manage and share code on the popular GitHub that allows them to check out code, make modifications, check it back in, and share it so others can merge it into their projects. Geoprocessing tools automate the import and export processes for JSON and Microsoft Office. Esri's mission for the User Conference has always been to create a venue for people to come together, share ideas, and learn from each other. During this conference, attendees shared their GIS stories, applications, and best practices. Users presented hundreds of papers about their work in agriculture, defense and intelligence, forestry, retail, transportation, and many other industries. They described real-world applications from data management, analysis, and imagery to mapping, platforms, and web GIS. A few of these stories were shared during the Plenary Session. From Roosevelt High School, Los Angeles, California, a team of 11th grade students demonstrated their class projects that uncovered environmental injustices in their low-income community. [Watch video.] Sponsored by renowned musician will.i.am, the i.am.angel Foundation is helping underprivileged inner-city kids set a course for professional careers. Dangermond sat with will.i.am on stage and talked about the science, technology, engineering, and mathematics program; value of education; and the need for professional mentors (see "will.i.am Embraces GIS"). CenterPoint Energy's Cindi Salas shared the benefits of its implementation of the new Esri Portal for ArcGIS. [Watch video.] It is similar to ArcGIS Online; however, the company hosts the platform on-site behind its own firewall. Staff uses the company's operational data, as well as outside content. The team demonstrated how Portal for ArcGIS is more secure, has more applications, and employs multiple datasets. This has transformed many of CenterPoint's business processes, as staff is moving from static maps to dynamic GIS maps. Tim Oliver, the GIO from Horry County, South Carolina, described how the county's enterprise GIS extends to county staff members who access it on their mobile devices. [Watch video.] The county requires that GIS be part of every significant project. The GIO demonstrated the value of the enterprise system for hurricane disasters, tax assessments, and crime management. Esri specifically acknowledged the work of three organizations. It's Enterprise GIS Award was given to the Lands Department of the Government of the Hong Kong Special Administrative Region and accepted by Mr. Siu Wai Ching, Dominic, JP, deputy director of survey and mapping. The Making a Difference Award honored the work of John E. Wennberg for the Dartmouth Atlas of Health Care. Dangermond presented his President's Award to Direct Relief, a nonprofit organization that provides medical assistance to people around the world who have been affected by poverty, natural disasters, and civil unrest. The award was accepted by Dorothy Largay, board member, and Andrew Schroeder, director of research and analysis. In addition, Esri extended special consideration to hundreds of exceptional organizations by recognizing their GIS work with the Esri Special Achievement in GIS Awards. Users shared their GIS projects by participating in the Map Gallery. More than 700 posters and displays showed applications and analyses that have made a difference in communities and the environment. Users also participated in the Lightning Talks forum, in which they described projects, applications, tools, and tips. Among these five-minute vignettes were applications for mapping paintable surfaces using lidar and 360-degree photography; for parental intelligence using real-time information, geofences, and location tracking; and for locating water features in the desert by using an iPhone. The Esri UC was the place to be for getting a crash course in all things GIS. Thousands of users honed their GIS skills at workshops for 3D imagery, ArcGIS Online, ArcGIS tools, scripting and coding tips, and more. At the Hackers Sandbox, developers tried ArcGIS and its APIs and software developer kit applications, developer services, and more. Attendees needing data assistance met with Esri's data experts who ran diagnostics on their data. Attendees brought their maps to the Map Critique Station to receive one-on-one advice from a professional cartographer. At the Technical Support Island, anyone could ask questions, get tips, and talk through solutions for making the most of their GIS. The ongoing GIS Managers Open Summit provided an open forum for decision makers to talk with peers about GIS approaches, management strategies, and technology values. From cloud deployment to lessons learned, senior executive teams shared their challenges and compared platform business values. Perhaps the most popular area of the Esri UC was the GIS Solutions EXPO, where more than 300 exhibitors demonstrated their solutions, applications, and gadgets. These Esri Partners are at the forefront of geospatial technology. In addition, Esri industry islands, staffed by topic experts, allowed anyone to meet and talk about anything. Many Esri Partners helped support the conference with sponsorships. Platinum sponsors, the highest level of sponsorship, were Amazon Web Services, DigitalGlobe, and Trimble. Esri thanks all Esri UC sponsors for their work in making the conference a success.